Be wary of your intentions; they form round bubbles around you to aid you in your flow down the stream of life. But they can also form compressive square boxes with rough edges that catch on everything, totally making the flow uncomfortable. These intentions can compress you whether they are your current ones, past ones, or from others impressed upon us...clear out the field around yourselves, starting deep inside yourself. If you can't see there, because of shadows, do not think that you ARE the shadow, and thereby do not hold light...you hold love. Created in love is the only way we get here whether it is your illusion of this time to believe that or not. I have seen into the deep shadows, and even there there is a long deep calling from love. Please listen deeply when you see shadows...there are many senses the Creator endowed you with. If one is temporarily resting, allow it and practice with another. Then you will become aware of the rainbows and butterflies and all the winged ones. --As you are, I am. 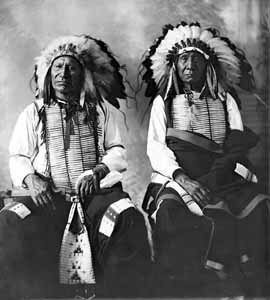 True in heart, your friend and relation, Red Cloud. Whom some call Chief.